Commander Showdown is a series that compares and contrast two similar commanders, analyzes differences in strategy and deck construction, and evaluates how those differences are represented by the data here on EDHREC. That’s right, the Egyptian God Cards face off against the Egyptian God Cards! With the aptly-named Trueheart Duelist, vehicles all over the Standard format, and the sweet new “Bicycle” lands, we’re all set for card games on motorcycles! Oh. Wait. Wrong game. One sec. Oketra the True and Heliod, God of the Sun have a lot of similarities. Both cost four mana. Both pay four mana to create creature tokens. They have roughly equal power/toughness, when you factor in Oketra’s double strike. While Oketra doesn’t passively grant vigilance like Heliod, she does make tokens with vigilance. Of course, there’s also an enormous difference between them, one that many players see as the greatest weakness of the new Amonkhet gods: they’re always creatures. The Theros gods can switch on and off from Enchantment Creature to just Enchantment, making them difficult to remove from the battlefield. Oketra and friends, however, are always creatures, and therefore more vulnerable to the occasional Path to Exile or Merciless Eviction. However, as it turns out, I think this always-creature-ness is actually one of the Amonkhet gods’ greatest strengths, particularly for Oketra. To understand why, we have to start by taking a closer look at Heliod. At first glance, Heliod, God of the Sun probably looks like a token-based commander. He makes tokens and gives them vigilance, so the game plan is just to pump out a bunch of tokens and swing, right? Well, not quite. His ability costs a little too much mana, so he’s a bit too slow to justify that kind of strategy. What we should focus on instead is the kind of token he makes: Cleric enchantment creatures. The fact that Heliod produces enchantments opens the door to some pretty insane interactions, ones that Daxos the Returned players are probably already familiar. With enough enchantments on the board, Sphere of Safety can make you nearly untouchable. Ajani’s Chosen effectively doubles your token output, which is super helpful. However, the real heart of a Heliod deck lies with two big cards: Serra’s Sanctum and Skybind. Sanctum obviously provides Heliod with an exponential growth rate to his creature tokens. Every token you make lets you tap the sanctum for more mana, creating more tokens, and therefore more mana, and therefore more tokens, and so on. The land really accelerates Heliod into pretty dangerous territory if your opponents don’t cut it off quickly. But Skybind is the real star. Creating enchantment tokens triggers constellation, which allows you to blink another nonenchantment permanent for a turn. The value this provides you is (pardon the pun) astronomical. One obvious use is to blink your own creatures for additional enters-the-battlefield (ETB) triggers. However, that’s thinking too small; how about blinking any enemy creatures that try to attack you? Better yet, how about blinking your own Serra’s Sanctum? Remember, Skybind doesn’t say ‘nonland,’ it says ‘nonenchantment.’ You can blink it every turn, so it comes back untapped, to provide mana on every opponents’ turn as well. You can even use the constellation ability to save your Sanctum from a rogue Strip Mine. This combo, along with Heliod’s slower pace, helps to reinforce the fact that Heliod isn’t exactly a ‘token commander.’ Yes, he’ll eventually use those tokens to win, but the tokens themselves are more of a resource than an army. Heliod players should be prepared for a game of attrition, rather than a brazen rush to battle. And this is where he and Oketra diverge so heavily in strategy. Heliod, who is so rarely a creature, remains lofty and impartial throughout the majority of the game. Oketra, on the other hand, is down on the ground and ready for action. This is her greatest strength. She offers a strategy entirely antithetical to Heliod’s grindy gameplan. Unlike her sun god counterpart, she’s always a creature. Does that make her more susceptible to removal? Sure, but she can also carry some sick weapons. Theros gods can dodge harmful spells, but that comes at a cost: they generally can’t hold onto any equipment, because it all falls off if they lose devotion. Oketra doesn’t have this worry at all. In fact, she’s more than eager to wield a few weapons for you, because she has double strike! Double the striking means double the triggers, and there are some excellent combat triggers we can capitalize on. Perhaps the most famous equipment for this is Umezawa’s Jitte, which provides a plethora of options every time you swing. If you need to draw cards, Sword of Fire and Ice and Mask of Memory may be of some assistance. You can even use Oketra’s ability to make creature tokens in-between strikes with a Sword of Feast and Famine. Also, is it just me, or does Grafted Exoskeleton look really scary on this here cat god? These are dangerous abilities to proc even once per attack, but twice? That’s a lot of value. All of this seems to suggest a typical equipment-voltron build. Decks like Kemba, Kha Regent or Nahiri, the Lithomancer can give us some inspiration for equipment-synergistic cards. Tutors like Open the Armory and Stonehewer Giant can come in handy. There’s also a lot to be gained from using Sigarda’s Aid, Sram, Senior Edificer and Puresteel Paladin to cheat costs and draw more cards. Sublime Archangel gives each of your creatures exalted, and since Oketra requires you to have at least three other creatures before she can attack, the triggers can get pretty bonkers. Even if you only have Oketra, Sublime Archangel, and two tokens on the battlefield, with no other equipment at all, Oketra’s damage output goes from a total of 6 to a total of 14. Eidolon of Countless Battles and Sigil of Valor also buff Oketra based on the number of creatures you control. You need to have creatures out anyway, so you might as well use them to power up your commander. Of course, none of these strategies will work unless we can actually get Oketra attacking, and for that she needs creatures on the battlefield. 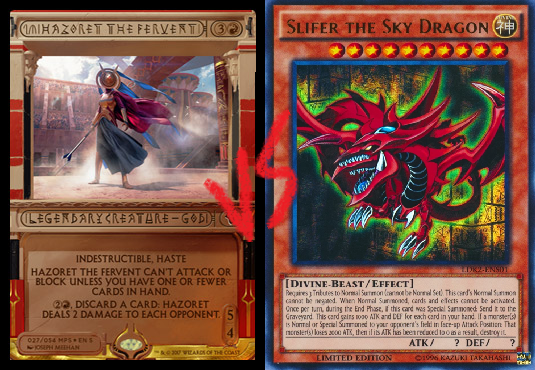 This is actually the most crucial aspect of an Oketra deck. Just like Heliod, she doesn’t function very well as the commander for a token-based strategy. The mana investment is just too expensive. In fact, she’s actually more comparable to Rafiq of the Many, packing a lot of punch with a singular attacker. Oketra doesn’t want an army of tokens, just three. So the trick to her deck is to find spells that hit that sweet spot, giving her enough creatures to attack without paying a lot of mana. It’s less about the Anointed Procession and Intangible Virtue and more about the Spectral Procession and Secure the Wastes where X=3. White also has plenty of creatures that enter the battlefield with additional tokens, such as Angel of Invention, which not only enables Oketra to attack but also pumps her up. Another standout is Knight-Captain of Eos, a useful little knight who functions as both token-maker and fog-on-a-stick. Naturally, there are the classics: utility creatures. These contribute to Oketra’s quota and provide useful effects. Mother of Runes helps keep Oketra safe while adding to the ‘body count.’ Weathered Wayfarer and Knight of the White Orchid do the same, but help out your mana base. A flock of Aven Mindcensors or Hushwing Gryffs can slow your opponents down while you get your commander ready for battle. It wouldn’t surprise me at all if Oketra became a deck full of ‘hate bears,’ like Grand Abolisher and Containment Priest, which simultaneously enable Oketra to attack and prevent your opponents from getting up to any funny business. But my favorite enablers for Oketra are definitely her lands. Oketra has access to several lands that can either create or become creatures, catching unwary opponents off-guard. Need just one more creature to attack with your cat god? Activate a Mishra’s Factory or Forbidding Watchtower. Why spend twelve mana to make three tokens with Oketra’s ability when you can just pay six for a Spawning Bed? Even mana rocks like Thunder Totem can help ramp you and become a creature if you need it. These might be unconventional sources for creatures, but they’re cheap in an emergency. Court Street Denizen. It’s not just the enchantment part of Heliod’s tokens that work in your advantage. You can also capitalize on the fact that he makes white creature tokens. This Denizen is another little way to keep enemy creatures off your back if you haven’t found your Skybind yet. Battletide Alchemist. Not only are the tokens white enchantments, they’re also Clerics. The Alchemist prevents a lot of damage even if you’ve only made a handful of tokens. Deserted Temple. I cannot believe this card does not even show up on Heliod’s EDHREC page. This land is fantastic for untapping Serra’s Sanctum and Nykthos, Shrine to Nyx. Mono-black players use it all the time for Cabal Coffers and Heliod should be using it for the extra mana boost as well. Martyr’s Cause is a bit cheeky, but it fits the theme of using your tokens as a resource. Each token can be used as a blocker, but they’re no good against creatures with trample or an enormous Comet Storm. This handy enchantment can prevent damage from non-creature sources, giving you a little extra safety, and even some political leverage if you so desire. Extraplanar Lens and Gauntlet of Power. You’ve probably heard of the ‘snow-covered land’ trick with Extraplanar Lens, to get extra mana without giving any opponents the benefits of your mana rock. However, I don’t think that trick is even necessary for the Lens to be good in this deck. In the wake of Commander 2016, playgroups have largely shifted to the new four-color decks. This technically means the odds of your opponents having white in their deck has increased, but it also probably means very few people are running a lot of basic Plains. Caged Sun is played in 58% of Heliod decks, and since Lens and Gauntlet provide the same kind of value, I think their popularity should be higher. Don’t sweep them aside just because they sometimes help your opponents; even if they do, the help they give you is much, much greater. It’s worth taking a look at your meta and giving these rocks some genuine consideration. Cathars’ Crusade. I actually recommend this card for both decks. Sure, neither of them are properly token-swarm decks, but if a Crusade goes unanswered, it ends games. This is a threat that demands an opponent’s response, or else. Plus those counters can stay on Oketra for more double-strike damage. Odric, Lunarch Marshal is just beautiful here. Even if you don’t have Oketra online just yet, she’s still a creature, so Odric will share her abilities with the rest of his brethren. Don’t have enough creatures to swing with her just yet? Odric can take up the mantle instead. He also makes an excellent indestructible blocker. Belfry Spirit fits into that Geist-Honored Monk-esque category of white creatures that create tokens. I suspect the Spirit will go overlooked, but it absolutely shouldn’t. Even after it dies, it can create a second wave of tokens, which is very useful for Oketra. Entrapment Maneuver. This little gem from Commander 2016 is a clever way to get more creatures on the board. If you time it right, you can really ruin an opponent’s day by ousting their one enormous attacker. Even if an opponent has other smaller creatures to sacrifice instead, that’s fine too; we only need three creatures to make Oketra an indestructible blocker, and then she can dish out some payback next turn. We can’t just focus on equipment — white has some excellent auras too! We don’t need those Shielded by Faiths or Battle Masterys, but a Spirit Mantle effectively makes Oketra unblockable, and an unblockable double-striker is nothing to scoff at. However, my favorite is definitely Pariah. This might be tough to stick on a Heliod, but it fits just fine on an indestructible cat. As long as you’re not playing against infect, this is a great way to protect your life total. It’s true that most of the new Amonkhet gods seem underwhelming for us EDH players at first blush. We naturally can’t help but compare them to the gods from Theros. It’s hard to ignore the fact that the Theros gods avoid a lot of removal spells, or that they even provide passive effects when they aren’t creatures, such as Heliod’s vigilance or Thassa, God of the Sea’s scry. But I think the Amonkhet gods can give you a run for your money. Oketra doesn’t dodge as much removal as Heliod, but she sure dodges more removal than Kemba, Kha Regent! It’s not every day you get an indestructible legendary creature to lead your deck. To that end, I think there’s room in the Magic Pantheon for the gods of Theros and Amonkhet! Who knows? There might even be a spot or two for whatever deities appear in Hour of Devastation. Joseph Schultz works in a library by day and shuffles libraries by night. He hosts the EDHRECast with Matt Morgan and Dana Roach over at http://edhrecast.libsyn.com/ and has recently taken over as Editor for the articles here on EDHREC! He was also born exactly one year before Magic: the Gathering, which he thinks is probably some kind of sign. Follow @JosephMSchultz on Twitter!